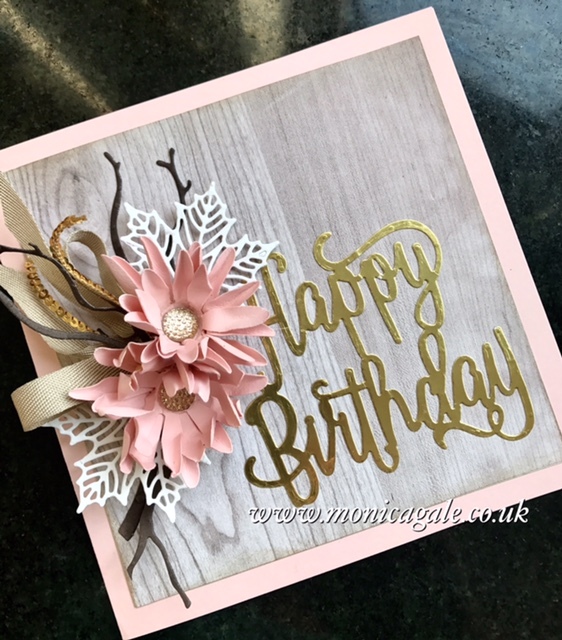 Here I am for the second time this week Blog hopping along, this time with my Global Friends from the Stamp To Share Design Team. And we are playing with the yumilicious Daisy Delight Bundle from Stampin' Up! And here's my first project, a rather elaborate card made for my beautiful sister who will celebrate a milestone birthday early next week. 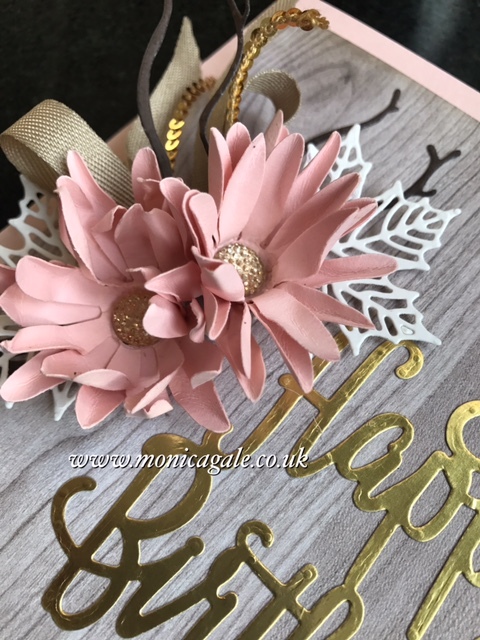 I have chosen the new In Colour Powder Pink and paired it with the lovely Wood Textures Designer Paper , I have to tell you I just cannot stop using this gorgeous paper. 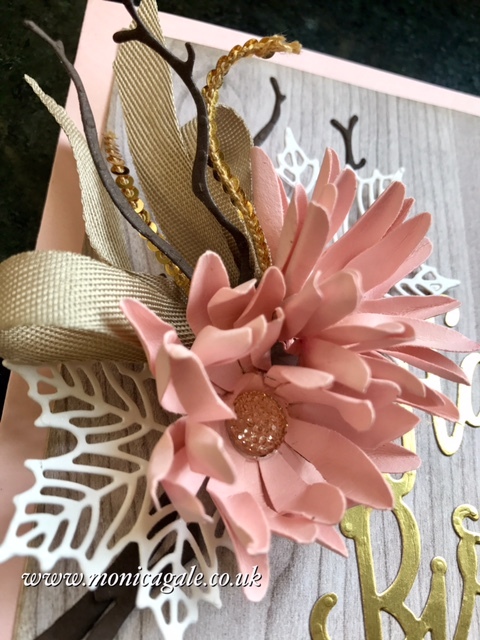 Wood texture is so current right now and these papers are such an incredibly easy to use product to add instant va va voom. 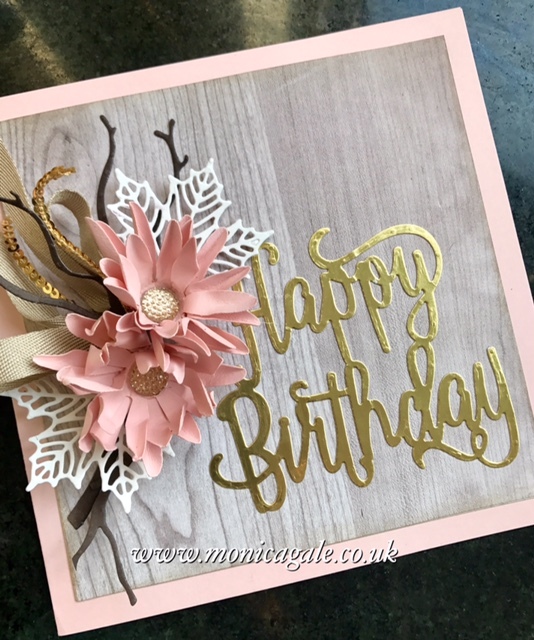 Another *I cannot stop using it* product is the gorgeous Happy Birthday Thinlits Die from Stampin'Up!, I cut it from some of the gold foil card. To make the flowers, I punched a few layers of daisies and spritzed them with water to soften them so that I could manipulate them a little. I think they look like the spidery gerberas and the Gold Faceted Gems were the perfect touch for the centres. And because I wanted this card to be extra special, I added a bit more interest behind the flowers with some leaves and a few spindly branches from the Colorful Seasons Bundle. I am delighted with this card and I cannot wait to hand it over to the Birthday girl. For my second card I went extra simple just because I was a bit crafted out. I made proper daisies from white card, my intention was to use the matching stamp set but I forgot so I ended up distressing my daisies with some inks to make them a bit more real looking. And for the background I actually used a card from the Color Theory Memories and More card pack. They are so happy looking, I really loved making them. Thank you for joining me today. I hope you have fun checking out what the other design team members have created. So head over to the lovely Amy Koenders. OMGosh, you have been making the most incredible cards Monica and this first one is so over the top, I absolutely Love it, and then I love the retro look of your second one....you rock! Oh my goodness love love love the vintage look! What a great idea to bend these flowers in different shapes. I haven't thought of that yet. Thanks for the idea. I love it!! Seriously? Your sister is gonna faint when she sees her Birthday card!! I adore everything on it!! Your second card is also waaaaay cute. Such a great idea to use M&M cards for a background! WOW, Monica! So lovely. Thank you for sharing! Hello, Monica, this is the first time I have been to your blog. I would like to say how adorable this card is. I absolutely love what you have done to the pink flowers. You have changed them from a cute daisy to another flower in the daisy family Gerberas. Which are my favourite flowers after Peony Roses. I love how you have used a Maple Leaf Die as the leaves and the Branch Die too. WOW, and Mind Blowing are words that are buzzing in my head. I hope you don't mind but I have a need to CASe this card, I will be making Gerberas a lot from now on. Cheers Christine from Dapto, NSW, Australia. Monica i love those cards, especially the first one it is perfect!! WOW Monice, how amazing is that :) !!! Your cards are beautiful, but your first card, WOW!!!! Love the idea with the daisy flowers, thank you so much for this amazing ideas! Beautiful cards. Love how you have done the daisies. Two gorgeous cards. Thank you so much for sharing these. Absolutely stunning Monica- your Sister will love it.